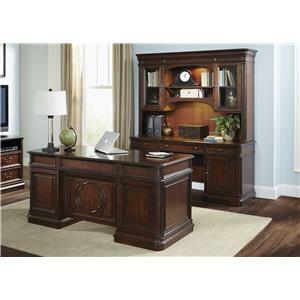 Add this traditional credenza and hutch to your office for a polished, professional look. 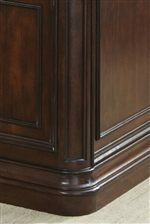 Stacked crown mouldings, framed panels and arched accents combine to create the elegant design. 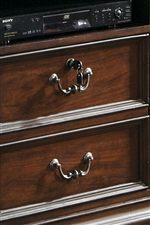 Constructed with Cherry and birch veneers over poplar solids the rich cognac finish is accented by dark antique looking hardware. 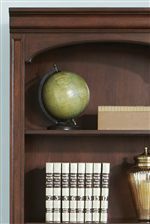 This combination has plenty of storage including two slide out trays for printer and scanner storage as well as three drawers and six shelves. 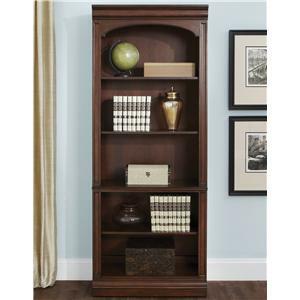 Touch lighting will illuminate prized valuables and make then the focal point of the room. 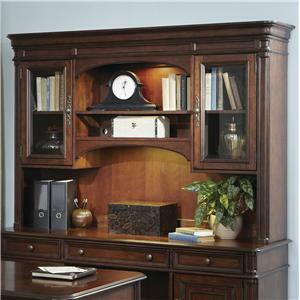 The Brayton Manor Jr Executive Traditional Credenza and Hutch with Framed Glass Doors by Liberty Furniture at VanDrie Home Furnishings in the Cadillac, Traverse City, Big Rapids, Houghton Lake and Northern Michigan area. Product availability may vary. Contact us for the most current availability on this product. 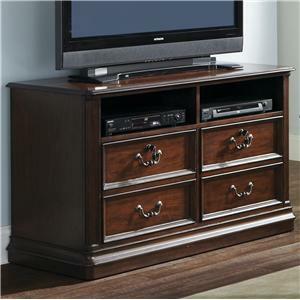 273-HO131 Credenza Hutch 1 68" 16" 52"
273-HO120B+T Credenza 1 66" 24" 30"
The Brayton Manor Jr Executive collection is a great option if you are looking for Traditional furniture in the Cadillac, Traverse City, Big Rapids, Houghton Lake and Northern Michigan area. 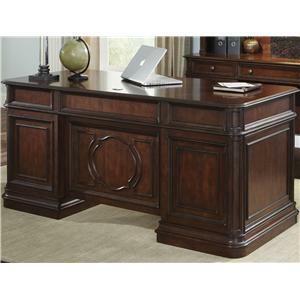 Browse other items in the Brayton Manor Jr Executive collection from VanDrie Home Furnishings in the Cadillac, Traverse City, Big Rapids, Houghton Lake and Northern Michigan area.